A good way to think of “Digital Transformation” is as a coin – it’s one coin, but with two complementary sides. You can’t have a head without a tail and vice versa. These two sides “go with” each other, they are complementary opposites but intrinsically related. On the one side, Digital Transformation is the process of changing existing business processes, organisational activities, and business models so that the business ends up being more digitally enabled. On the other side, it considers the amount of introspection and collaboration between people and departments that are needed to make sure solutions are designed that not only meet business objectives, but also customers’ needs. At its core, Digital Transformation is about four C’s: Change, Culture, Customer, and Communities. The change associated with embracing digital technologies to radically improve business performance. Creating and nurturing an internal culture of innovation so that it becomes second nature. Transforming the customer experience through a better understanding of customer needs. Building communities that drive customer loyalty and ensure sustainable future business. The world is changing fast, and so too are customers’ expectations. If one becomes content with resting on the laurels of past achievements, one fails to recognise and pursue the opportunities that will help one adapt to what the future holds. 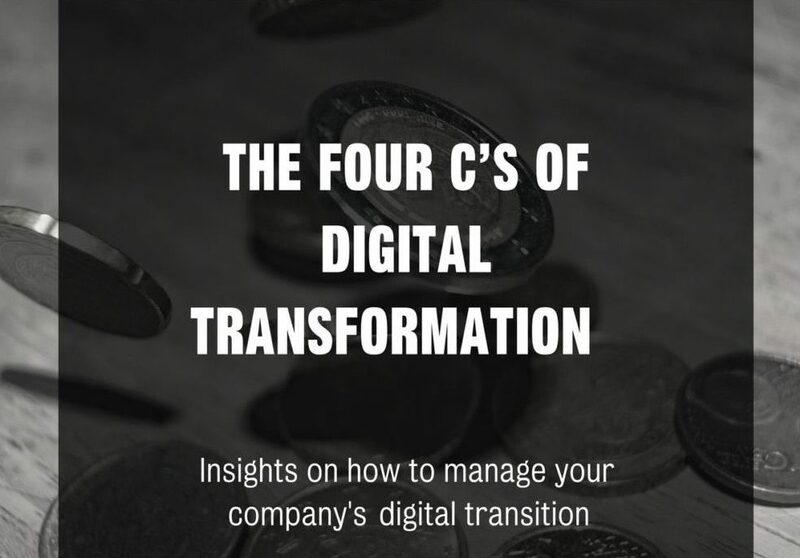 If you’re the custodian of your company’s digital agenda, what should you do to drive a successful digital transformation journey? While a vision and a strategy for your journey is a good starting point, it shouldn’t end there. Your vision, no matter how great and inspiring, is only as good as your ability to implement it. So, kick up a few gears and translate it into an overarching digital transformation programme comprised of multiple projects that can be planned, prioritised, and managed. And make sure you staff up for it, because you’ll have a lot of balls in the air once you press the green button! Invest the time upfront to consult with your most important stakeholders when you develop the strategy and design the transformation programme.The board needs to approve budget and direction, the executive committee have to protect and defend it through formal sponsorship, department heads need to give valuable input and willingly compromise on their own struggle for resources in favour of the digital transformation journey. Don’t be scared of diversity when tackling the programme – valuable input and critical support often come from places you never anticipated. Gone are the days when “digital” was banished to be the realm of the Marketing or IT departments. Success will come from a holistic, multi-faceted understanding of the entire organisation and its goals, blended with real customer understanding and guidance. Make sure you identify your key stakeholders to the long term digital transformation programme as well as for each project stream, and then manage and reward their involvement through watertight programme management practices. If your company is in need of a strategic reset, an action plan for your digital transformation journey, and a hands-on partnership to drive this journey with you, get in touch with us. At Creative Spark, our expertise in digital programme management, change management, customer experience management, and technical delivery might be exactly what you need to help you operationalise your digital strategy. Send your queries to our head of Digital Transformation, Ika van Wyk, at ika.vanwyk@creativespark.co.za.